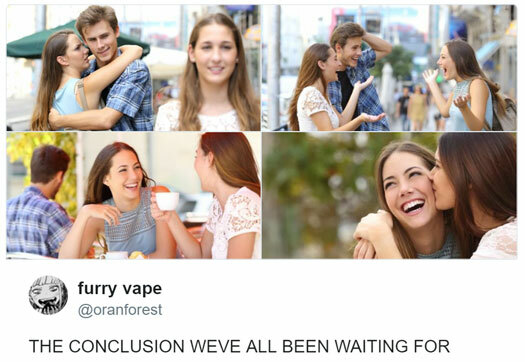 A while back, the Distracted Boyfriend meme was everywhere. For those of you who don’t spend their days scrolling aimlessly online like I do: this particular meme is a stockphoto of a guy checking out a girl who walks by, with his perplexed girlfriend (or so we presume) looking at him like he’s going to spend the night on the couch (or in a grave). The meme sparked a lot of creativity, ranging from this to this to even stuff like this. I make use of stock images a fair bit – for my blog, but for my other work as well – and I love, looove this category of staged stockphotos. I’ve become quite familiar with certain scenes, and it’s not uncommon for me to recognize pictures or models in completely different contexts. I once saw a whole row of happy (and very ethnically diverse) faces on a partition wall around a construction site, that I recognized from an editing app in which those same faces were used to show the app’s teeth-whitening and acne smooth-over tricks. And just look at these joyful (and very non-sweaty) gals who apparently have quite the flexible gym membership, judging by the amount of Dutch gym ads they’re in –yoga’ing in Utrecht, highfiving in a town called Heelsum and being… I guess just being present in school. When I find that a big company has used one of those free stockphotos for their own marketing, it always feels like I’ve caught them in the act. Although they’re allowed to use free images, of course, to me it always reeks of cheapskates when an organization doesn’t even want to spend a couple of bucks on a well-made picture shot by a professional. And, naturally, I can't help but wonder what their search words were. Teamspirit? Facial expression? Teeth? And then, of course, there’s also this. The video for the song Drugs by Ratatat (2010) is compiled completely by stock footage from Getty Images, and it’s horrorlike quality reminds me a lot of Blackhole Sun (Soundgarden, 1994). See for yourself. Me, I like. PS. Guess who I ran into when visiting Ibis’ site to make my point? Tadaa! OMG, they look so excited. LITTLE DID SHE KNOW. Penny Lane aanvragen en de tekst van de literal video meezingen. Dat vond echt alleen ik leuk. Onterecht, want de video is geniaal. Literal video's zijn videoclips die opnieuw zijn ingezongen met een songtekst die beschrijft wat er in de videoclip gebeurt. Penny Lane is mijn favoriet (Don't get trampled, John), Bonnie Tyler is runner-up. Enjoy. Edit: Eens in de zoveel tijd duikt de literal version van Penny Lane ergens op, om vervolgens weer van het internet te verdwijnen. Zodra hij weer online is plaats ik 'm hier, tot die tijd moet je het doen met Bonnie.